Life moves fast, and we don’t always have time for sit-down meals. If we are traveling, it may be virtually impossible to spend an hour at a lunch counter between flights. At home, between soccer games and band practice, again, there just might not be time for a sit-down meal. Julia Stamberger, president and CEO of GoPicnic recognized that fact and developed a line of ready-to-eat, grab-and-go snack boxes. No novice to this business, Julia was the one who conceived, developed and launched United Air Lines’ shelf-stable buy-on-board meal program and first-class snack box program, featured today on airlines worldwide. In a box just 5 x 7 x 1-1/2” thick, she’s packed in a wide variety of tasty snack packages. Together they can make up for that meal you would have surely missed otherwise. Whether it’s on a plane or in the backseat of your mini-van, you can now enjoy a multi-course meal whenever the need arises. Oh, and when you are done snacking, you’ll find that the inside of the box contains a Sudoku puzzle and some fun food facts. I recently tried three different snack boxes and they were all excellent. In a typical box, you’ll get five different items. In the “Steak Nuggets and Cheese” box, I found a pack of Steak Nuggets (like beef jerky). a pack of multi-seed crackers, a Parmesan peppercorn cheese spread, a fruit and nut mix bag and a buttercrunch toffee candy bar. It even came with a small plastic knife for spreading the cheese spread. 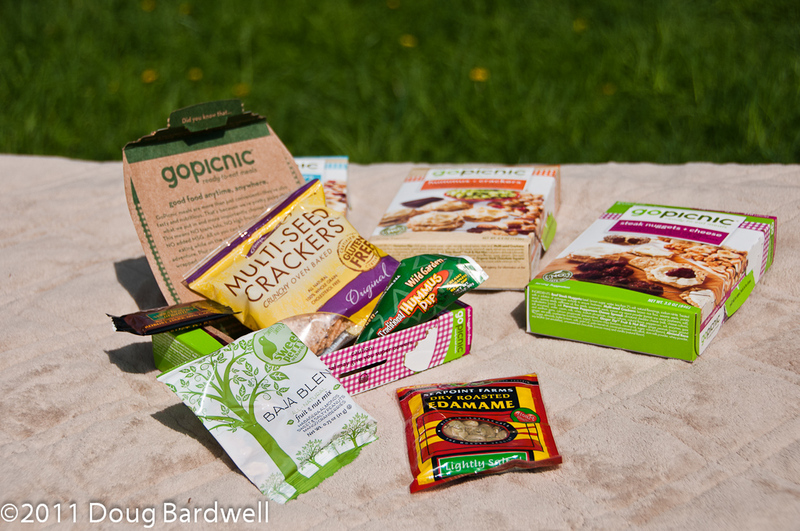 GoPicnic products contain no trans fats, high fructose corn syrup or added MSG, and no artificial colors or flavors. That sounds pretty healthy to me. Now you can enjoy foods from high-quality big and specialty manufacturers while also feeling good about eating nutritious, better-for-you foods. Chances are that you’ll fall in love with some of the ingredients in the GoPicnic boxes; but, no fear, you can order some of the individual ingredients in bulk through the GoPicnic website http://GoPicnic.com. Combined with larger, what they call “care packages,” there’s a size to fit all budgets and appetites.